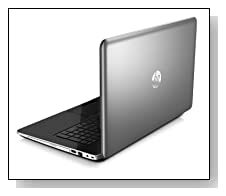 Anodized silver HP Pavilion 17-e123cl is a 17.3 inch touchscreen laptop designed as a desktop replacement fairly mobile PC for those that prefer larger screen computers. It offers a quad core AMD Elite A8 processor, 8GB RAM for being able to handle daily tasks as well as the multimedia or any demanding applications. The unit that is reviewed on this page is certified and refurbished but it doesn't mean it will have any wear and tear on hardware and still comes with a 90 day warranty and comes with all of the brand new HP accessories. 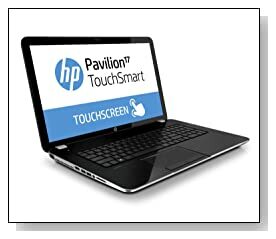 HP Pavilion is offered with the lower mid-range quad core AMD Elite A8-5550M accelerated processor (4MB cache) at 2.1GHz speed (up to 3.1GHz with turbo boost), 8GB DDR3L SDRAM system memory for superior multitasking of power demanding apps and programs and 1TB Serial ATA hard drive at 5400rpm rotating speed as generous amount of storage with fast read and write times so you can save hundreds of thousands of images, songs and hundreds of hours of videos in high definition. Operating system is the 64-bit version of Microsoft Windows 8.1 so there is no need for upgrade from the standard Windows 8. 17.3 inch HD+ BrightView LED-backlit responsive touchscreen display that is optimised for Windows 8.1 with 1600x900 pixel resolution,16:9 aspect ratio and AMD Radeon HD 8550G integrated graphics card with up to 4206MB total shared memory with the main CPU offers a display quality that is quite nice to look at with sharp images and vibrant colours and the multimedia and gaming performance of the HD 8550G is comparable to NVIDIA GeForce GT 625M so you can easily play the latest games at medium settings. HP TrueVision HD webcam with built-in microphone is good for both casual live chats and video-conferencing for work purposes although we'd think this is more of a desktop replacement unit to be used at home, but there is certainly no reason why you can't use at work- except for the reduced amount of portability you will get with 15.6 inch computers. UV paint finish in anodised silver HP Pavilion weighs 7.74 pounds and measures 16.5 x 10.5 x 1.35 inches so it is not very lightweight or slim but it is for a 17.3 inch laptop. 47 Wh 2200 mAh 6-cell lithium-ion battery gives you up to 4 h 45 min of battery life on a single charge (Energy Star qualified computer). It comes with a full-size keyboard with 10-key numeric pad and a touchpad that supports multiple gestures. It comes with a SuperMulti DVD drive unlike many other modern day laptops so that you can play videos from and read and write CDs and DVDs as well as 802.11b/g/n Wireless LAN, 10/100/1000Mbps Gigabit Ethernet with RJ-45 connectivity for wired internet access, SD memory card reader, 2 x USB 3.0 ports, 1 x USB 2.0 port, 1 x headphone-out/microphone-in combo jack, 1 x VGA port, 1 x HDMI port and Kensington MicroSaver Lock Slot. Conclusion: The AMD Elite A8-5550M processor on HP Pavilion 17-e123cl has adequate CPU and GPU performance and can be compared to an Intel i3-2310M in terms of speed and overall performance with even some current game performance- but not at higher settings. Windows 8 is not really what it is made out to be by many computer users and the 8.1 upgrade that you will see pre-installed on this PC comes with useful additional features and it is often a very short learning curve. The RAM size is 8GB and the maximum you can have is 8GB on its two memory slots but it is plenty for majority of computer users. It comes with a 90-day limited parts and labor warranty and you're getting a handsome discount thanks to this unit being a certified refurbished one- but definitely not different to the brand new version. We would recommend this computer if you have a certain amount of budget for a computer and you want some of the best value for your money. You probably won't be able to tell it is the certified refurbished version.